Above are two Handcrafted Silver Rings - The Handmade Mens Silver Ring on the left is a unique, one-of-a-kind handcrafted Silver Ring that was made to be worn by a gentleman with character! It is artisan handcrafted that any gentleman will appreciate if he likes the color green. This green gemstone in this Ring is breath taking and will catch the eye of the most critical connoisseur, as it is brilliant and enchanting as well. The Silver work John has put into this handcrafted Silver Ring is exceptional and is of a timeless design. 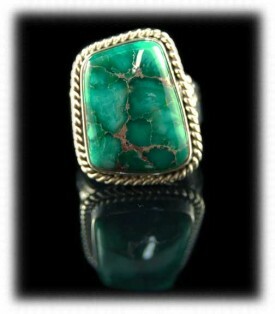 This is a very comfortable Mens Turquoise Ring to wear as are all of Johns Rings. To the right is a Victorian style Women's Bisbee Turquoise Ring. 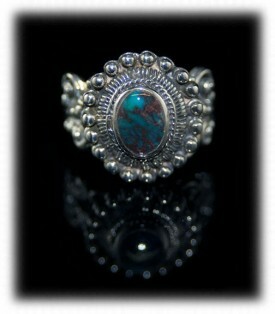 This handcrafted Silver Ring features an oval Bisbee Turquoise Gemstone set in an elaborate Sterling Silver setting. 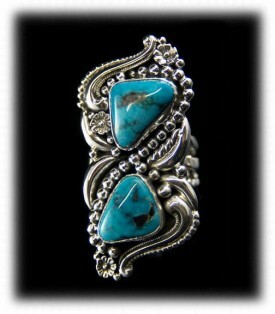 This natural American Turquoise cabochon is surrounded by filigree designs. Durango Silver Company produces unusual Handcrafted Silver Rings with exceptional Gemstones as well as outstanding Silverwork, we always have a good amount of Silver Rings as they are our specialty. 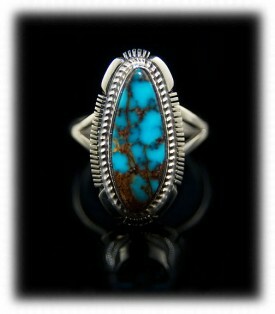 Above and to the left is a one of a kind Handcrafted Morenci Turquoise Silver Ring! It was handcrafted by John Hartman of Durango Silver Company with two excitingly beautiful natural Morenci Turquoise gemstones from his personal collection of over 40 years. 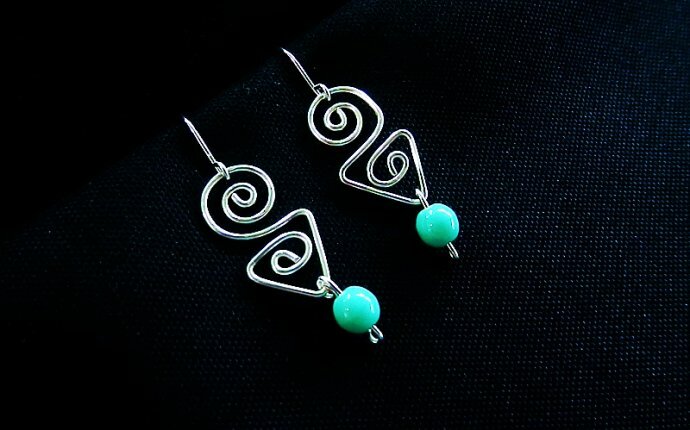 The Morenci Turquoise is set in a Victorian style that John is well known for, worldwide as he has been creating this type of Silver Jewelry for over 40 years. The Silver work in this Ring is substantial with layers of heavily tooled Silver which sits on a fancy tooled 925 Silver Ring shank. This is a remarkable handcrafted Silver Ring with a very high quality piece of Morenci Turquoise from an old, out of production Arizona Turquoise Mine . Proudly handcrafted in the USA! 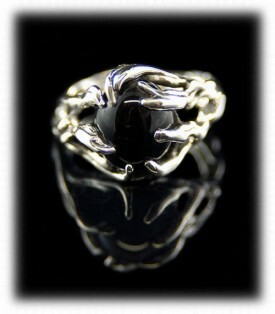 To the right is a Lost Wax Style handcrafted Black Onyx Sterling Silver Ring by Crystal Hartman. This unique Silver Ring has a real organic feel to it as it is designed to look like vines wrapped around the Black Onyx Gemstone. This beautiful Silver Ring was artisan handcrafted in Durango, Colorado USA. Above and to the left is a Native American Indian Handcrafted Silver Ring by Edison Yazzie. Edison is a Native American Indian Artisan that has been making Silver Jewelry for many years. He is known for his unique style of gemstone inlay work. Edison is able to make uniquely curved inlays that most other inlayers would not attempt. Edison does this intricate work and comes up with one unique piece of handcrafted Silver Jewelry after another. Edison's work is great and a good investment in Handcrafted Silver Jewelry. This ring would even make a great wedding ring silver bands. To the right is a Handcrafted Silver Ring with and outstanding Red Mountain Turquoise Gemstone by Leo Yazzie. This beautiful and very collectible Silver Ring is elegant and remarkable. This handcrafted silver women’s Ring features a top grade spiderweb Turquoise cabochon from the Red Mountain Turquoise Mine of Nevada USA. The cabochon is bezel set and surrounded by twisted Silver wire and hand sawed designs. The Ring top sits atop a two prong Silver Ring shank. 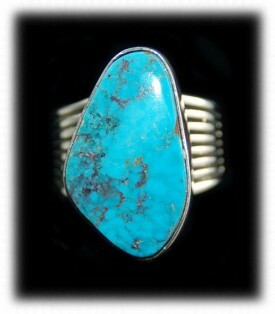 The Red Mountain Turquoise in this ring is rare, collectible and seldom scene for sale. 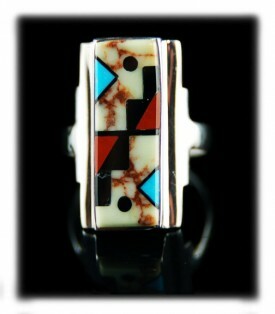 This is a Native American artisan handcrafted Silver Ring from New Mexico, USA and is hallmarked “L.M.Y and Sterling”. We hoped you enjoyed this brief introduction to handcrafted Silver Rings by Durango Silver Company. We invite you to take a look at a couple of our other presentations on Handcrafted Silver Rings Jewelry, Handmade Jewelry and Handcrafted Turquoise Jewelry, we have a vast library of informational pages in our Silver Jewelry Learning Center - check it out! Again, we hope you have enjoyed our presentation on Handcrafted Silver Rings and have gained some useful knowledge from it. We invite you to learn more about Handcrafted Silver Rings and American Silver Jewelry by following the links in our Learning Center to other informational pages that we have written on different topics related to Silver Jewelry. In addition, we would like to invite you to join our - about once every other month we send out a Newsletter to inform our members of what's happening with Durango Silver Company, new products, specials for our members and more. We also have a monthly drawing from our member base to give away from our company. Please take a moment to become one of our friends by signing in below. We thank you for your time and hope you will think of Durango Silver Company the next time you are considering Handcrafted Silver Rings.